What should I know about selecting firewood? Many people prefer to heat their homes with wood, and for good reason. Wood gives a rich, dry heat that seems to warm you from the inside out. Many also prefer the dancing flame of the fire itself to that of a gas or oil burner. 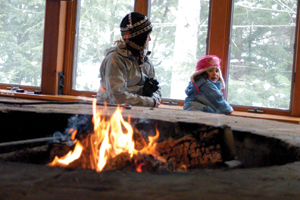 Plus, modern wood stoves reduce pollution. Choosing wood is easy. Oak has more heat content than maple, but the main consideration is dryness. It takes about 12 months to fully season firewood — that is, for it to air-dry enough to allow it to burn efficiently. Green wood—that which isn’t yet sufficiently dry—burns poorly. It gives off more smoke and less heat, plugs up your chimney and ultimately wastes your money. Species matters less than dryness, so whatever wood you use, make sure it’s been split in half, if not quarters, for at least nine months before burning. For those who cut their own wood, remember that we have a serious invasive pest in our woods: the emerald ash borer. Though treatment efforts are underway, this devastating beetle has no predators and is ravaging our ash trees. And it’s not the only bad bug out there. The ambrosia beetle, black walnut twig beetle and gypsy moth may all hitch rides in the backs of trucks loaded with firewood. For this reason, Maryland’s state parks don’t allow you to enter with your own wood. Also bear in mind that snakes and other wildlife may seek cover in woodpiles kept outside. One of the greatest hallmarks of firewood is it’s natural. Odds are that it grew within 15 miles of your home, so it’s the ultimate “buy local” example. The economics of burning wood is still a good deal as well, even with the recent decline of fossil fuel prices. Pound for pound, or rather, dollar for dollar, wood is about as cheap as oil, and let’s be honest: wood is just plain prettier. And more fun. And satisfying. About 23,000 Maryland households use wood as their primary heat source; most users rely on it as a secondary source. If you are thinking of switching to wood, the Maryland Energy Administration offers grants to help you get started. We get many calls from people either with questions about buying their seasons supply of firewood or what they can do after recently purchasing wood they were less than happy with. There are a few things you should know about wood and the laws regarding selling firewood that will help you make the best decision when making your firewood purchase. When selecting a firewood dealer you should take several things into consideration. If the dealer is in the firewood business, they shall have a Forest Products Operators License issued by the Maryland Department of Natural Resources - Forest Service. The Maryland Forest Service can provide you with a list of licensed operators in your area. If you have found a potential dealer, you can easily check if they are properly licensed by calling (410) 260-8531 or by using this link: FPO, select "firewood" and your county. If you haven't worked with a particular dealer before, they should be willing to offer you references of customers they have delivered wood to before. If they're not willing to offer you a list of customers, those customers may not be happy ones. Maryland law states that firewood must be sold by a cord or a fraction of a cord. This is enforced by the Maryland Department of Agriculture's - Weights and Measures section. If you have a concern about the volume of wood you have paid for you should contact them at (410) 841-5790. Note: they only handle matters where the volume of wood is in dispute. So, what is a cord? A cord is a measurement of wood that when neatly stacked and rowed equals 128 cubic fee t. This stack measures 4 feet tall by 4 feet wide by 8 feet long or its equivalent (which means stack it neatly any way you like as long as it equals 128 cubic feet). Not all wood is created equal! Different woods have different qualities. Oak creates a lasting fire and splits easily. But oak may be expensive and other woods may work just as well. Some woods are less dense and have different splitting and coaling qualities. Here is a short comparative list. The more moisture in your wood, the less heat you will get from it. It takes energy to burn the water out of wood (it may make a hissing sound). This is energy that should be used in warming your house. Generally, the dryer the wood, the more you'll pay for it. Know what sized wood your woodstove or fireplace can use. Most dealers will cut wood into certain lengths (for example 18"). To get special lengths you may have to special order it early or pay a premium.